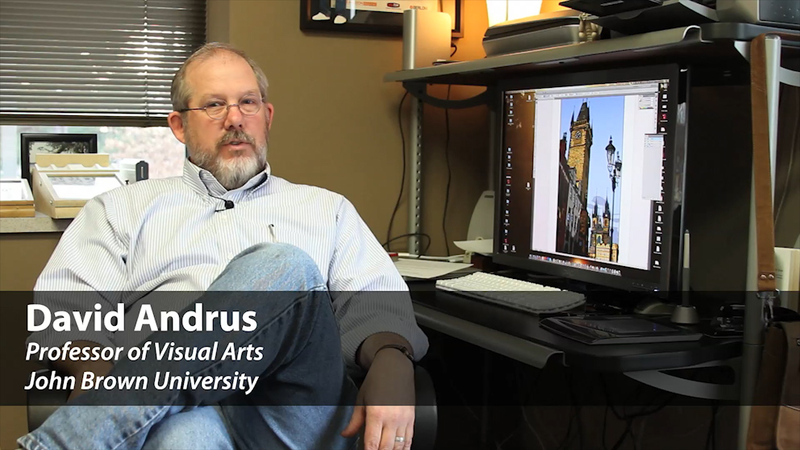 Hi, my name is David Andrus, and I’m a professor of visual arts, and my area of expertise is graphic design. Graphic design classes are taught by doing. Right from the beginning, Graphic Design I, we start doing work, and they bring it back and we put it up on the wall and we talk about it. Everything we’re doing in this building we’re intentionally doing to prepare students for life after JBU. We don’t offer any classes here that we think of as this is just academic stuff and it doesn’t really matter out of school, it all matters. Everything we’re doing is to try to help the students build the best possible portfolio that will show up well in a job interview. We’ve got excellent equipment, we’ve got beautiful rooms to work in, [unintelligible], wonderful place to come to work in, and I hope it’s a wonderful place to come to study. Our students compete well in the marketplace, I think we do a good job because we care, we care about the students, we care about what we’re doing here, trying to do this as unto the Lord, and he’s blessed it and it works.